Funcom today released the second DLC for Conan Exiles, the studio’s open world survival game which launched in May this year and quickly became the bestselling Funcom title of all time. 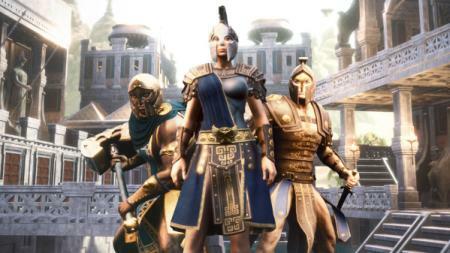 The DLC, named Jewel of the West, introduces Aquilonia-themed building pieces, weapons, armor, furniture, and more. In Conan lore, Aquilonia is the center of the civilized world and the new content allow players to build homes and monuments in the grand style of this great nation. Jewel of the West Pack is now available on PC, Xbox One, and PlayStation 4, introducing new Aquilonia-themed building pieces, armors, weapons, and decorations.For more information about the Jewel of the West Pack, check out the official blog and the Steam store. The DLC is available on PC, Xbox One, and PlayStation 4. In addition to this new DLC, the development team is also hard at work on one of the biggest free updates to the game yet. For more information on what the developers are working on, check out the official blog. Conan Exiles is an open world survival game set in the savage lands of Conan the Barbarian. After a successful Early Access run starting in January 2017, the game launched in full on PC, Xbox One, and PlayStation 4 on May 8th 2018 and became one of Funcom’s best-selling and fastest-selling games to date. For more information about the Conan Exiles, visit www.conanexiles.com.